Here is an interesting comparison of two martyrs. One Giocante Casabianca aged 12 years and on the other hand is Sahibzada Fateh Singh aged 6. Casabianca was trapped in ship on fire in 1798 while Sahibzada (on Dec. 26, 1705) was asked to accept conversion to Islam but he along with his 9 year old brother refused the offers of of many lavish gifts and a future of cosy comforts of royalty. Sahibzada was given ample time to decide while Casa had few options. 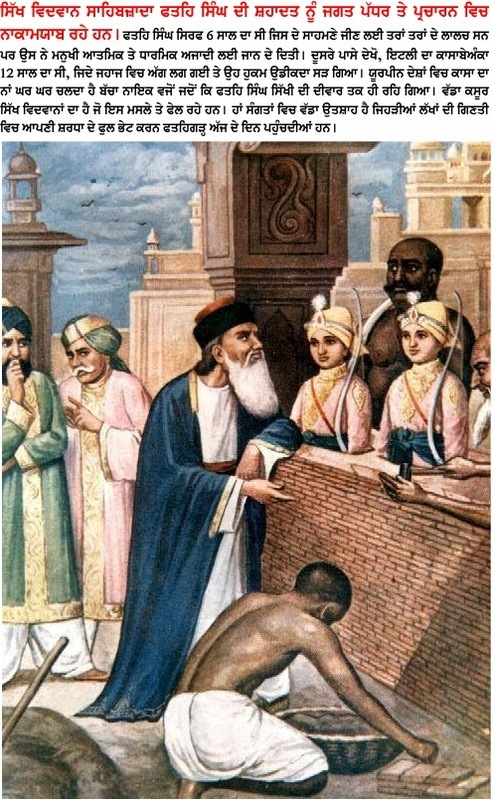 Today Casa is a universal hero while Fateh remains bricked in the wall. The ideal martyr is one who has options before him. Haven't we Sikhs failed to project Fateh Singh or the world is indifferent? The reason I believe is the sad political status that the Sikhs are in but the Sikhs in Diaspora can't run away from the responsibility. They too have failed to project it. Really sorry for the Sikh intelligentia. However the nation is thankful to the spirited masses who are gathering at Fatehgarh sahib today not in thousands but in millions.